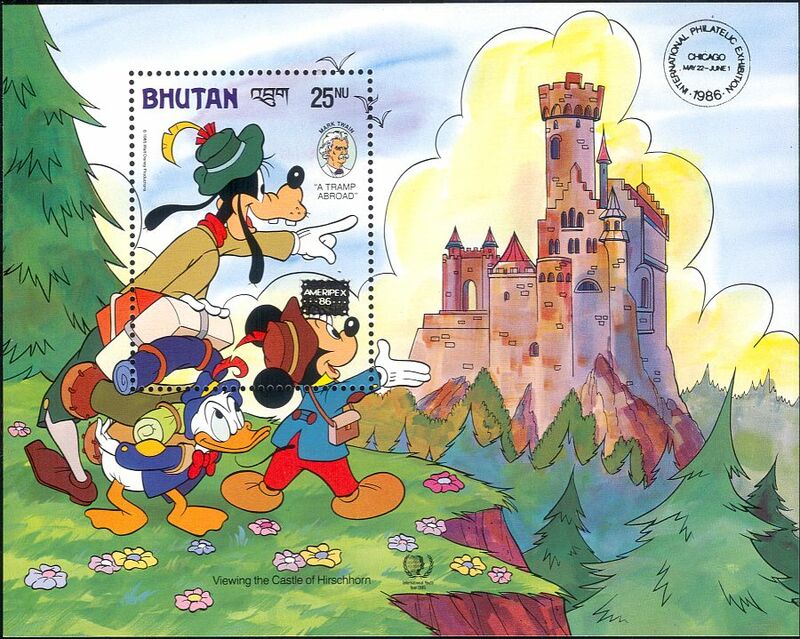 Bhutan 1986 "Ameripex '86" International Stamp Exhibition 1 value miniature sheet (as 1985 Mark Twain (Author) 150th Birth Anniversary issue with Overprint) depicting Mickey Mouse, Goofy and Donald Duck looking at Castle Hirschhorn in scene from "A Tramp Abroad" - in superb u/m (mnh) condition - excellent country, people, writers, writing, books, literature, art, artists, cartoons, mickey, stampex, animation, castles, buildings thematics. If you cannot find the specific stamp set or thematic/topic you are looking for either here in my shop or at the brumstamp stamp shop on eBay http://stores.shop.ebay.co.uk/The-Brumstamp-Stamp-Shop please do not hesitate to contact me. Enjoy browsing and shopping. Andrea!